Our on the scene reporter, John Graham, takes a time tunnel trip to do some shopping from a 1971 toy catalogue featuring a rare HORIKAWA FIRE ROBOT, plus BATMAN, SPEED RACER, JAMES BOND, BLACK BEAUTY and THE MONKEES. "We proud to present", no my typing hasn't slipped up! My title comes from the cover blurb of the Aoshin Co, "Toy Catalogue '69", upon which they happily exclaim "WE PROUD TO PRESENT YOU OUR EXCLUSIVE LINE FOR 1969"! Such delightful misprints as this, which are well known for appearing on the boxes of Japanese tin toys, also seem to have snuck their way into the promotional material as well. Japanese tinplate toys. To so many collectors, they are the be all and end all. They're the Everest of tin toy manufacture. Put simply, they are Art. Perfecting techniques used by the Europeans and Americans before them, the Japanese toy-makers of the post WWII period went far beyond anything seen before. Their outstanding colours, their zany actions, their unbridled all pervading joy. Once unleashed upon an unsuspecting world of gleeful consumers, there was no turning back. These tin toys even had the power to help rebuild the entire Japanese economy after the Second World War. Although many of these toys are now highly regarded, their beginnings were humble, and like all forms of mass merchandise, they had to be marketed in order to be sold. One of the major methods of promotion by Japanese companies was the time-honored catalogue, a glossy all-colour guide to next year's toy product. Ironically, these annually updated promo brochures, which were liberally given out to prospective buyers by traveling company representatives, have become collectibles in their own right. Often printed on high quality paper, they are a brilliant reference guide to when a certain toy was made, what type of toys a particular company was responsible for, and even more wonderful... they are a wish book like no other! So many of the toys lurking within their once commonplace pages are things that none of us may ever see. And to think! Not long ago, I could have placed a few wholesale orders. Lets see, looking in the "Aoshin Co. Toy Catalogue" for 1969...the battery-operated Remote-control Siren Patrol Car looks nice. Ten inches of Japanese Ford for $48 - per dozen! 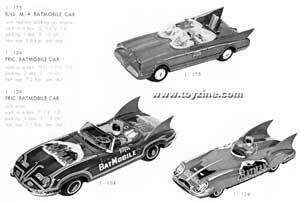 And check out that 12-inch tin battery-operated Batmobile! At $84 - per dozen, I'll take a gross! Alas, most of the companies of Japan's tinplate heyday are no longer with us. Those that are have radically diversified in order to survive. So I can't place my fantasy order. But thanks to those hard-working folks in the promo departments during the Golden Age of Japanese tin toys, we have a glorious photographic testament, an incredible archive of childhood artworks, some exhibits from which are now lost forever. HORIKAWA TOY CO., also known by their trademark alias "SH", is most famous for their seemingly infinite variety of square box robots with angular prismic heads. And just to prove that their designers could do infinity plus two, this off beat "NEW" pair was created. MR. HUSTLER looks for all the worked like your average, run of the mill happy Horikawa, until..."DO THE HUSTLE! dum-dum dumdum dum de-dum-dum-dum". As if bopping along to the disco tune which gave him his name, MR. HUSTLER flexes out his powerful tin shoulders while a dazzling dance floor lightshow swirls rapidly beneath the transparent orange plastic on his chest. I remember owning one of him as a child, and those popping arm sockets made him second to none in my toybox! Article No. 1038, FIRE ROBOT, is another story altogether. None of the trash egotism of MR. HUSTLER can be found here. FIRE ROBOT is the perfect human servant, the kind of robot that authors Isaac Asimov dreamed of with his "Three Laws of Robotics". Diligent, Self-sacrificing, Unquestioningly Brave, this mechanical marvel of fire-fighting technology would be a miracle worker for any modern day Fire Dept. in Toytown. In reality, FIRE ROBOT is one of HORIKAWA'S most exotic creations. I'd bet my bottom dollar that if you hadn't seen him in full bloom, you would never have guessed that an extending ladder with two tiny humans atop is what emerged from his chest. Firing guns with flashing lights, sure! But a telescoping ladder and some baby firemen? No way!!! Also, FIRE ROBOT is the only HORIKAWA of the 'square box' style that I have ever seen to have a separate remote control box. These robots almost exclusively have their battery compartments concealed beneath a tinplate door in their backs. My guess is that with the ladder mechanism and siren machinery packed tightly in its chest, there was just no room left for the usual battery housing, hence the remote. One last tidbit of trivia about these two... they both appear as upcoming new product in the "HORIKAWA TOY '71" catalogue. Yes, that's right, 1971! Often ascribed by collectors and dealers alike to the 1960's or even the 1950's, it is fascinating to discover that some Japanese companies were producing high quality tinplate toys for the mass world market as late as the first years of the 1970's. Although our pair were "NEW!" for 1971, many of HORIKAWA'S other robots were manufactured for quite a long period. 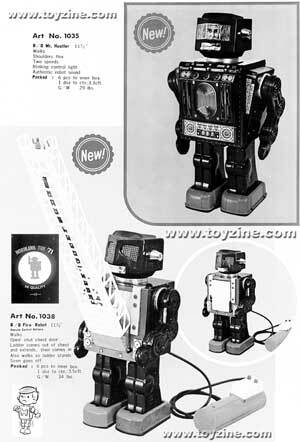 For instance, the ATTACKING MARTIAN robot, one of HORIKAWA'S better-known items, made its debut in the early 1960's and was available in its all-tinplate form until at least 1971, as it also pops up in the catalogue for that year. However, it was redesigned and re-released in the mid-1970's in a smaller, mainly plastic and less desirable format.